Let me break it down for you: 12 years of Catholic school. Powder-blue communion suit. Did the Stations of the Cross ON MY KNEES for multiple years. Childhood best friend was an altar boy. (He's fine. Nothing ever happened. Thanks for asking.) I say all this to establish that I know all about nuns. Nuns have paddled me. Nuns aren't allowed to be cool. This means that new mobile game Nun Attack is committing blasphemy. Sweet, sweet blasphemy. You know what real-life nuns have under those robes? Support hose. Know what Nun Attack's sisters have under their habits? Shotguns. Pistols. Secret papal spells. The title from Frima Studios is an action strategy game that has you managing a squad of four gun-toting nuns as they fight against necromantic enemies like skeletons and exploding demons. 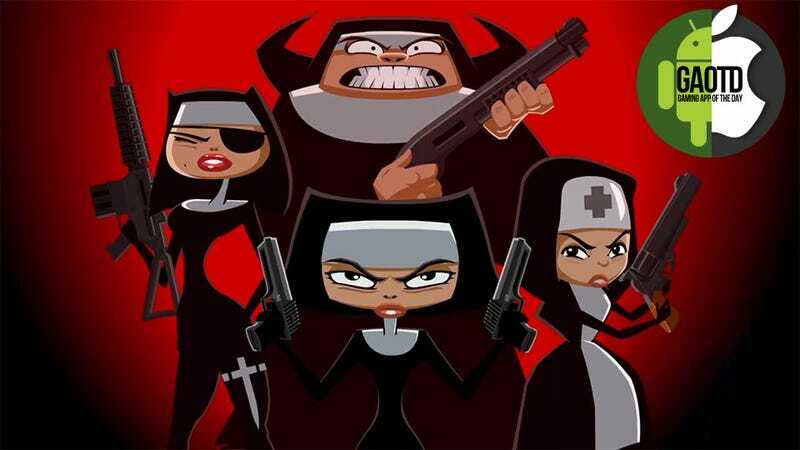 Nun Attack's cartoony art style and lively animations make the action fun to play and the controls-tap and drag to move characters across a map and to target enemies-are simple. Each level contains portals placed there by the Fallen Nun, a devotee and former ally gone wrong. They'll launch projectiles at you, some of which you can redirect with a flick of your finger. Purple portals can be blown up on the map, while bronze portals open up arena battles where enemies come at you from all angles. Once you get going, the threats come pretty quickly. One minute, you're dodging the explosive skulls that evil portals are lobbing at you, the next you're frantically managing health and constantly deploying special abilities to stay alive. It's a fun mix that also includes upgradeable skills and gesture-based Miracle super moves that do things like heal every character. I'll probably need to go to a whole lot of confessions after playing this.